This product was added to our database on Friday 6 June 2014. The threat of enemy aircraft striking American naval forces at night with impunity during World War II led the Navy to seek fighter aircraft capable of stopping this threat. Trace the history of radar-equipped night fighter aircraft produced for the U.S. Navy and Marine Corps by the American aircraft companies Grumman and Vought before the arrival of jets with nocturnal capabilities. World War II squadrons operated night variants of the Vought F4U-2 Corsair and Grumman F6F-3/5N Hellcat while post-war night fighter units were equipped with the Grumman F7F-3N Tigercat and/or Vought F4U-5N/NL. 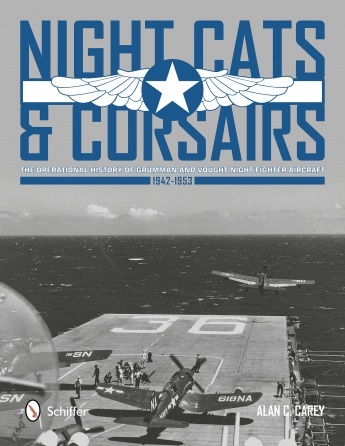 Night Cats and Corsairs contains never before published color and black and white photographs covering the night variants of the F6F Hellcat, F7F Tigercat, F4U-2 and F4U-5N/NL Corsairs.